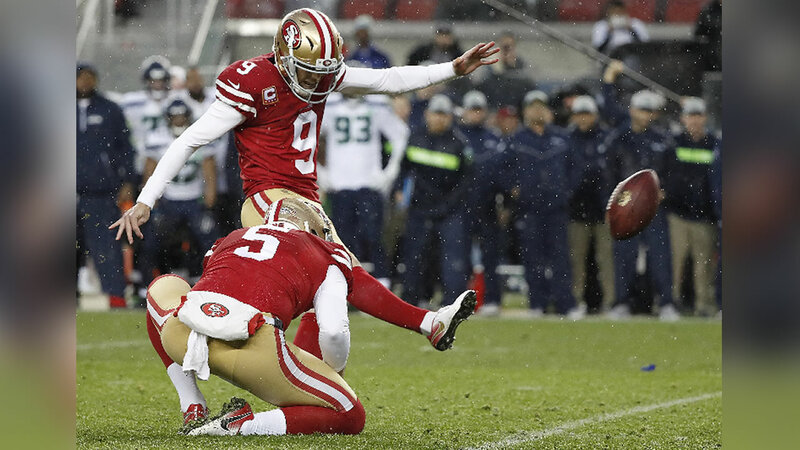 This image shows San Francisco 49ers kicker Robbie Gould on Sunday, Dec. 16, 2018 at Levi's Stadium in Santa Clara, Calif.
SANTA CLARA, Calif. (KGO) -- The San Francisco 49ers snapped a ten-game losing streak to division rival Seattle Seahawks, and did so in thrilling, overtime fashion in front of the 49er Faithful at Levi's Stadium. With just three minutes left in overtime, Robbie Gould, who was 4/4 on the day, kicked the game-ending 36-yard field goal to win 26-23. The win robbed the Seahawks of a chance to clinch a playoff spot, making the victory even sweeter. Seahawks scored first, but the 49ers responded. On the ensuing kickoff, Richie James ran it up the right sideline, breaking 97 yards for a touchdown. This was the first 49ers touchdown return since Ted Ginn Jr. in 2011. Quarterback Nick Mullens went 20/29 for 275 yards and a touchdown. Russell Wilson threw for 237 yards and two touchdowns. Chris Carson ran for 119 yards and a score, but Wilson was unable to generate any points on his final three drives, leading to the loss. 49ers beat Seattle and win two in a row for the first time this season. The only negative for some, the 49ers dropped from first to fourth in the draft order. #49ers Twitter is hilarious. A bunch of fans ecstatic over finally beating Seahawks. And another group frustrated with Niners for dropping down to 4th in draft order. Which side are you on? You can go here for more stories on the 49ers.